Super Mario Bros. Quilt Along: 3 of 12! The Piranha Plant block design is courtesy of Karen @ The Recipe Bunny on Flickr. Her finished Super Mario quilt is beautiful, and I love the way her quilting really makes the characters POP off the background! 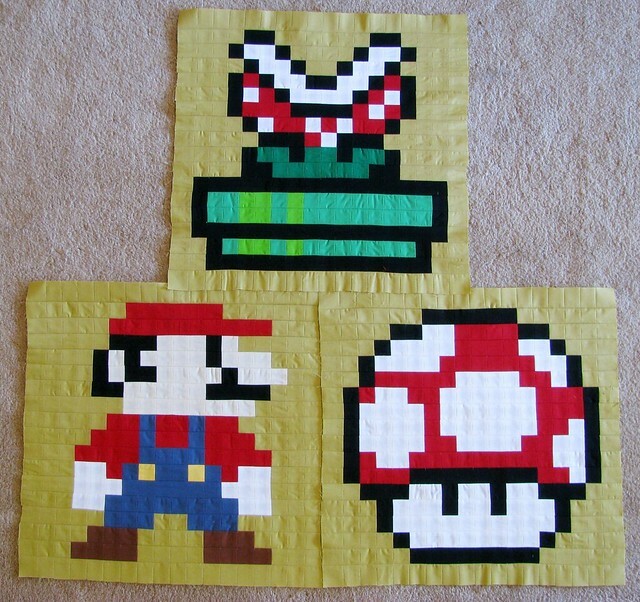 You can join the Super Mario Bros. Quilt Along at Cut to Pieces. Join us! Lol, thank you! They are time consuming, but the blocks are fun to make. I’m only making ONE quilt and my two kids are both trying to take ownership of it. I’ve had to tell them I’m keeping it myself!